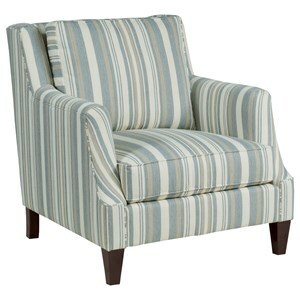 Subtly feminine and impeccably stylish, this cozy chair displays a classic rolled and button-tufted back style alongside traditional rolled arms. 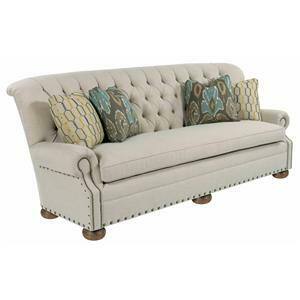 Adding a modern splash to this look are two sizes of nailhead stud, scalloped arm panels, and wooden bun feet. Furnishing this chair is the standard design of multi-layer Comfort Support seat cushion, but an upgrade of the seat cushion comfort is available for additional charge. 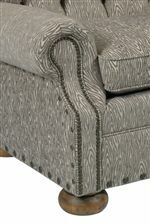 The Spencer Traditional Button-Tufted Chair with Rolled Back and Nailheads by Kincaid Furniture at Johnny Janosik in the Delaware, Maryland, Virginia, Delmarva area. Product availability may vary. Contact us for the most current availability on this product. 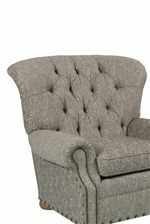 Padding & Ergonomics Multiple cushion options are available to suit your comfort level. Additional charge may apply. 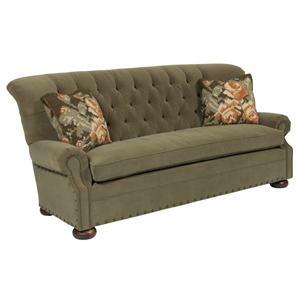 The Spencer collection is a great option if you are looking for Traditional furniture in the Delaware, Maryland, Virginia, Delmarva area. Browse other items in the Spencer collection from Johnny Janosik in the Delaware, Maryland, Virginia, Delmarva area.